Seven gorillas have now been shot and killed this year, more than during the conflict that wracked Africa's Great Lakes region in the late 1990s, prompting UNESCO Director-General Koïchiro Matsuura to call on Congolese authorities to introduce urgent measures to try to end the killings. He also announced that a joint mission involving the UNESCO World Heritage Centre and the World Conservation Union (IUCN) will head to the DRC later this month to investigate why there has been a surge in gorilla killings. In the most recent attack, probably on the night of 22 July, four gorillas - one "silverback" male and three females - were killed near Bukima. 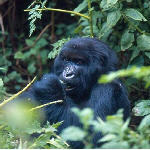 Two other gorillas, a female and her young, are now missing. "The disappearance of these gorillas represents not only a tragedy for the preservation of the species, but also the loss of an important source of revenue for local communities," Mr. Matsuura said in a press release issued from UNESCO headquarters in Paris. The killings this year have been concentrated in the southern part of the Virunga National Park, which is close to the border with Uganda and Rwanda. Virunga was inscribed on the World Heritage List in 1979 for its outstanding natural habitats, but the gorilla killings have led the World Heritage Committee to inscribe the park on the List of World Heritage in Danger.